Guys, The PS Version of DYRL was released here in Hong Kong on 27th May 1999. I bought it today 28th May. Included are a total of 3 discs, that is 2 DYRL game discs and one demo disc with playable demos of VF-X2 and Patlabor Ver.2. I haven't even looked at DYRL yet as I've been busy playing the demo of VF-X2. 1. Revenge of the terrible midi music..........Yes, VF-X2 suffers from poor BGM as does the original VF-X and it still can't be turned off....grrrrr. 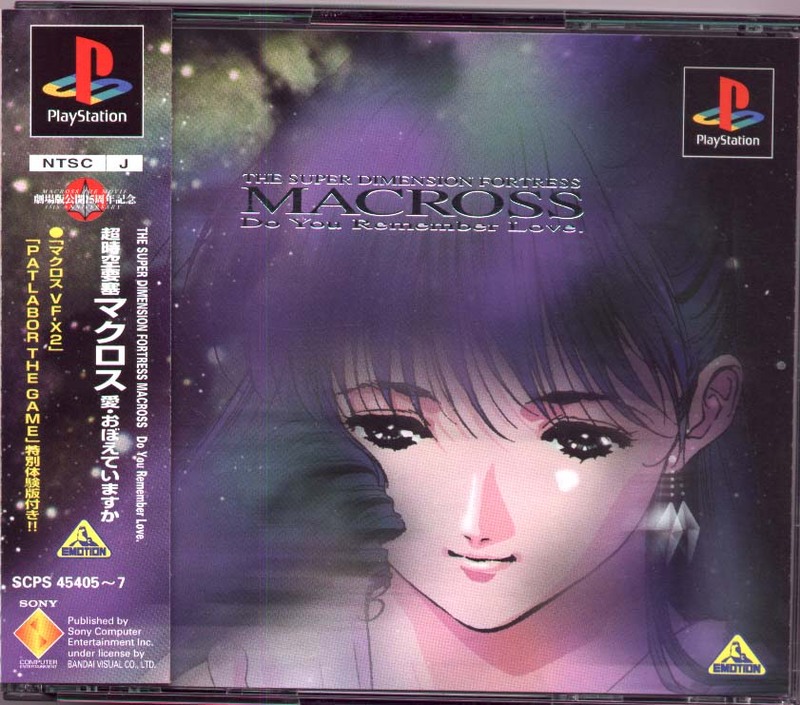 Actually, this time around the music is a little better, but it's still not Macross music damn it!!! 2. Poor Gunpod SFX. The Gunpod sounds really weak and tinny and sounds like it is firing at a really slow rate of fire rather than the several thousand rpm that those things fire at. 3. Blocky backgrounds. While the VFs look great, the backgrounds (at least in the single demo stage) looks very blocky. 4. Stationary objects in level 1 such as the ground and the SDF-1 do not get closer when you try to fly towards them. 1. A new Fire Bomber(?) opening song called "Catch Me"
2. Variable View Feature. Three separate views can be chosen in game play, "Target", "Missile" and "Forward". Has to be seen to be believed. Great feature. 3. Much more realistic feeling of flight compared with VF-X. You actually feel like you are flying a VF. 4. C.G. gallery option of stills from the opening movie. More later, gotta get back to playing. Guys, I want to give you a bit more information on the playable VF-X2 demo that comes with the PS version of the DYRL game. Basically this single stage playable demo is AMAZING. There is no in-cockpit view in the game. personally, I don't consider this as a bad point as I always play original VF-X and the Ace Combat series using the external view anyway. As I mentioned yesterday, VF-X2 has a feature called "variable view" which allows three different external view points to be chosen as you are playing. the first of these is called "Forward" which gives a view slightly behind and above your VF. The second view is called "Target" in which the target you are locked onto is always displayed on screen. Depending on your VF's position in relation to the target, your VF could be displayed from any angle when set on "target". The third view type is called "Missile" which tracks enemy missiles as they approach and allows you to more easily dodge them or shoot them down with your Gunpod. It might be a bit difficult to visualize what I am talking about, you really have to try the game. Anyway, the flying in VF-X2 is far more realistic than the first game. The VFs' have vapor trails which stream off the wings which look really cool when you are performing high-G air combat maneuvers. The vapor trails also give an indication of how fast you are flying (you have to see it really understand what I mean. The realistic aircraft handling combined with the variable view feature and the transforming ability of the VFs finally allow proper realistic Macross style dogfights. Each VF in the game has three types of weapons. The main weapon is the Gunpod which on easy level holds over 9,000 rounds! Two types of missiles are also available. The VF-1X Plus has standard missiles and micro missiles. the VF-11B has standard missiles and Hi-maneuver missiles. More standard missiles are carried than other types. The time needed to lock onto targets is quite long with the two VFs I have tried. Hopefully more advanced VFs will have a superior lock on ability. The first stage is called "Gigant Lullaby" and is set on 10th April 2050. Either the VF-1X Plus or VF-11B are available in stage 1. The 1st stage opens with scene showing your team diving down through Earth's atmosphere to engage one wave of unknown aircraft (possibly the drones from episode 1 of Macross Plus although they are grey not orange) followed by a VF-11, then another wave of drones followed by a second VF-11B. After wiping out the drones and VF-11s', a cut sequence shows the Ghost-X9 launching from underwater just in front of the SDF-1. the player then has to engage and destroy the Ghost. I have only been able to do this once on easy level while flying the VF-11B (hey, Guld only just did it in a YF-21!). When your VF is destroyed, it explodes in a nice fireball. Two improvements over the original game is that the player's VF is not as difficult to destroy as they were in VF-X. In fact hits by 3 or four salvos of missiles will wipe you out in easy level. I prefer this as it is more realistic and encourages better flying. Also, when you are hit in VF-X2, you do not uncontrollably bounce around the screen as in VF-X, which is a feature I really hated. 1. There is no way to turn of the BGM or adjust the BGM and SFX volume. 2. The SFX are not particularly very good especially the Gunpod sound. 3. In level one, if you are flying straight and level, the landscape does not appear to get any closer and the only indication of forward movement is from the vapor trails from the VFs' wings. however, when you are in a dogfight, this is not that noticeable. 4. The landscape in level one is very very blocky. I hope this will improve in the production game or in later stages. Although the whole opening movie is not shown on the demo, some new scenes that I have not previously seen are shown. My favorite is one where two VA-3Ms are shown dropping a string of MK-82 bombs. In my e-mail yesterday, I mentioned the opening song was called "Catch Me". Well, this might have been a mistake. After listening to it more carefully, it sounds more like "Get Free". Onto the PS Version of DYRL. Well, I've only played up to level 5 (end of disc 1) so far, but I haven't noticed any new footage. However, I'll have to dig out my Saturn and run the SS version side by side for an accurate comparison. Game play is identical, to the original SS version, but the cut scenes lifted from the DYRL movie seem somewhat darker and grainier than on the SS version. Again I'll have to do a side-by-side test as it is too long since I played the Saturn version.